Lightning components navigation re-defined in Winter’17 ! Woooo-hooooo ! So, here comes one of my most favorite features of Winter’17. One which I have been looking forward since a very loooooong time. Finally it’s here. A native lightning event that will allow you to navigate from one lightning component to another. Traditionally, to get this done, you had to write your own lightning event which was pretty tough. I mean it’s like catching your nose from behind. This event will come as a big time relief to all those who have been wracking their heads to navigate from one component to another. The force:navigateToComponent event enables you navigate to another component easily within Salesforce1 and Lightning Experience. Note: This release contains a beta version of force:navigateToComponent that’s production quality but has known limitations. This feature isn’t generally available unless or until Salesforce announces its general availability in documentation or in press release or public statements. We can’t guarantee general availability within any particular time frame or at all. Make your purchase decisions only on the basis of generally available products and features. You can provide feedback and suggestions for this feature in the IdeaExchange. To navigate from a Lightning component to another, specify the component name using componentDef. So, the sad part is that this event is still in the “beta” mode, but I am hopeful that Salesforce will make it generally available very soon. Let’s hope for the best ! Now, let’s get our hands dirty with a small snippet that will demo how this thing works. I will simply define two components here named as “MyComponent1” and “MyComponent2” and using this event we will see how we can traverse back and forth seamlessly without any hassles. 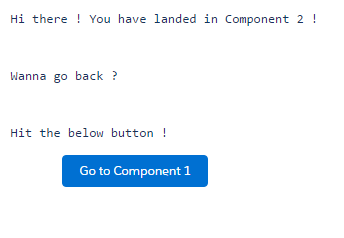 So, below is the code snippet for MyComponent1 and it’s controller. 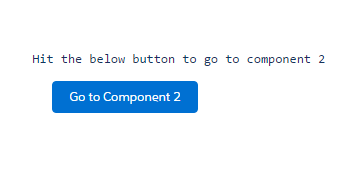 So, on the click of the button, it will just fire the NavigatetoC2 button and fire the component navigation event and jump to MyComponent2. You can just re-use the same event in the second component to traverse back to the original component. You just have to add the “MyComponent1” to a lightning tab and it’s all set as seen below. Previous Previous post: How to add business days to a date in Salesforce formula ? Next Next post: Power of Point & Click Series – 1 : Tricky ways to use roll-up summaries to your best ! Would it work properly on Communities using community builder? I built a component to use on communities and I’m not able to make it works. I have never really tried to put this component into a community. As long as you are using the Salesforce template in your community i believe it should work. Sorry about that. The snippet I posted got deleted midway. In the component headers use the below interfaces. Yeah, I was already using it. Really odd. It seems that the event is fired but nothing happens to the page. Hi dudunato, did you ever get this to work in a community? I’m having the same problem that you are. Too bad it’s not available in Community! can u tell me how to solve this ? I have the same issue, did you manage to resolve it? My first component is on a Lightning Page / Tab. I cannot come back to the page itself but only to the component. Is is possible to add an URL after componentDef ? Once I navigate to the compoent, I want to click a close button and have the component go away, returning to the place it was called from. I cannot seem to find the correct syntax for that. Is there a close(), Destroy() or something i am missing? I have tried the code given in the blog and i am getting the below error.